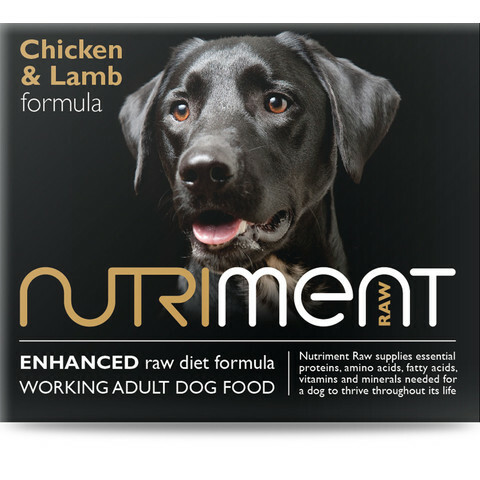 The Nutriment Chicken & Lamb Formula RAW Frozen Adult Dog Food is available in two formats, either a 500g tub or a 1.4kg chubb. Nutriment RAW Frozen Chicken & Lamb Formula provides essential proteins, amino acids, fatty acids, vitamins and minerals need for your dog to thrive throughout its life. Nutriment RAW Frozen Chicken & Lamb Formula is made with 85% British meat, offal and bone, and 15% vegetables, fruits and natural super foods. Moisture 61.96%, Protein 14.8%, Fat 15.03%, Ash (inorganic matter) 5.1%, Fibre 0.2%.